"There are many options where medical tests can be taken other than at the stadium." Presidential candidate Volodymyr Zelenskyy wants to take medical tests in a laboratory owned by his supporter, businessman and TV presenter, Andriy Palchevskyy, according to his adviser Dmytro Razumkov. "There are many ways to take medical tests other than at the Olympic stadium. I think that looking what is going on there today, there are a colossal number of security details, a cordon… This is strange," he said at a briefing. Instead, Zelenskyy's HQ suggested Eurolab, one of Kyiv's privately-owned medical test centres. "We are inviting our opponent and all of you for 8 in the morning tomorrow. This is an independent laboratory where tests can be taken and no-one will have any questions," Razumkov said. Eurolab is owned by Andriy Palchevskyy who has been openly supporting Zelenskyy in the presidential election. However, in Razumkov's opinion, this lab is less biased than the Health Ministry. Earlier in the day, Poroshenko invited Zelenskyy to take medical tests at the first aid station at the Olympic stadium. 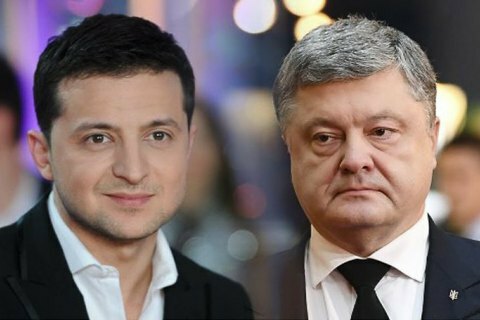 It was Zelenskyy who on 3 April challenged Poroshenko to take blood tests to check for narcotics.